While shopping for the next perfect handbag to fit my wallet and keys I grabbed my hair and screamed at the store associates to stock more purses for the modern grrls. A retro look in a small size, with a bit of style and "puff". So became the Twiggy Tweed bag, I picked up my trusty Domo-kun topped US #7 needles and the cool new Plymouth Tweed, in two nights I finished my purse and went back to those stores to laugh at the prices of their fugly pleather bags. 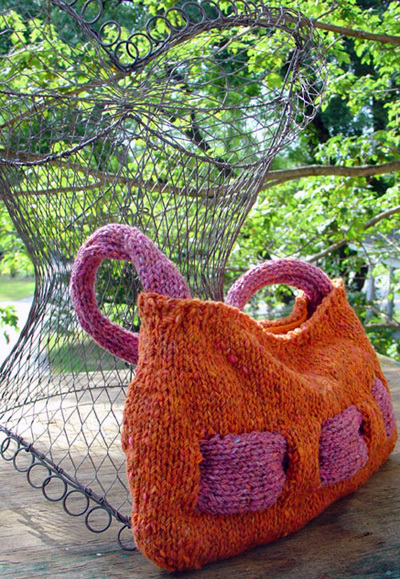 Rock your own bag with black and hot pink, bright yellow and blue, or pick the feminine colors we all love to hate. model: Missa photos: Brian C.
Gauge is not critical for this project, but be sure to work at a tight tension to obtain a firm fabric. Instructions for Mattress Stitch can be found here. 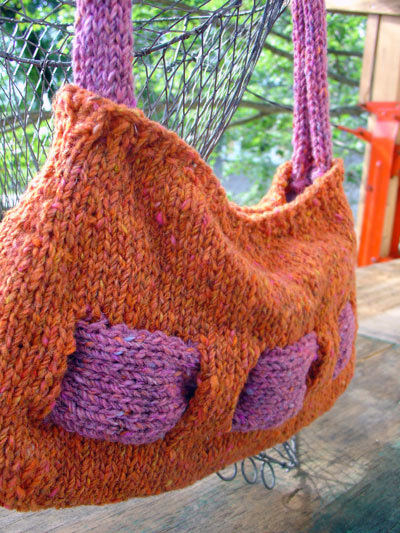 Instructions for Slip Stitch can be found here. Row 1: [K1, p1] to end. Repeat this row for 1x1 Rib. Using MC, CO 48 sts. Work 2 rows in 1x1 Rib. Beg with a WS row, work 7 rows in stockinette st.
Increase Row [RS]: [K1, kfb] twice, k to last 5 sts, kfb, k1, kfb, k2. 52 sts. Work 3 rows in stockinette st.
Work Increase Row once more. 56 sts. Work 5 rows in stockinette st.
Set-up Row [RS]: K7, [BO 10 sts, k5 (6 sts on right needle)] twice, BO 10 sts, k to end. Work 9 rows in stockinette st over last 7 sts on needle only. Break yarn and slide this group of sts down the needle, out of the way. Attach yarn to next group of sts with WS facing and work 9 rows in stockinette st. Break yarn and slide this group of sts down the needle. Repeat for remaining 2 groups of sts, but do not break yarn when last group of sts is complete. Joining Row [RS]: K7, [CO 10 sts, k6] twice, CO 10 sts, k7. 56 sts. Work 7 rows in stockinette st. Decrease Row [RS]: K2, ssk, k1, ssk, k to last 7 sts, k2tog, k1, k2tog, k2. 52 sts. Repeat these 2 rows once more. 48 sts. Using CC, CO 10 sts. Work in stockinette st until work measures 11 inches. Using CC, CO 12 sts. Work in stockinette st until work measures 17 inches. Position one decorative panel behind holes on one purse body piece, so that WS of body piece is facing RS of panel. Sew ends of panel to edges of body piece using slip stitch. Pin panel to strips between holes, distributing extra fullness of panel evenly between holes. Sew edges of panel to edges of holes using mattress st, catching approx. 2 rows of panel for each st of edge of hole. Assemble remaining body piece in the same way. Cut t-shirt open along side seams. Lay it flat so that the front and back of the neck opening line up. (You will need to fold it slightly forward of the shoulder seams, as the front neckline will be cut deeper than the back.) Pin both layers together in several places. Lay one purse body piece on top of the folded shirt with the top edge of the bag at the neck opening of the shirt. Trace the shape of the bag onto the shirt. Draw a second line approx. 1 inch outside the first line; this will be your cutting line. Cut out the lining, cutting through both layers. Sew bag body pieces together along bottom and side edges. Weave in remaining ends. Sew lining to inside of bag, around opening. Sew magnetic closure in place. Sew ends of handle to inside of bag, sewing through both lining and bag body. Missa wants everyone to listen to their yarn. "Start a swatch and see what happens; the yarn will talk to you." 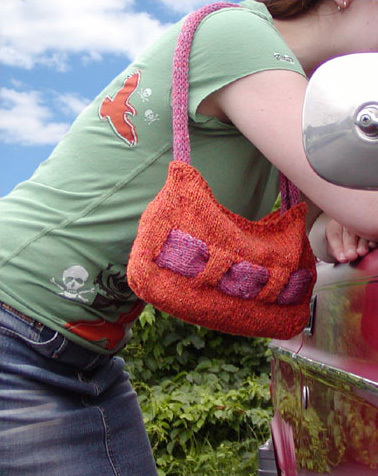 She blogs about yarn, owns a yarn store, and yarns around town in her classic Volvo cars.